We now have scientific evidence that pastured chicken is more nutritious than the CAFO chicken factory meat sold in the typical grocery store. Your choice in chicken is now clear. I have previously posted comments made by a number of sources that free range and/or pastured chicken was better, but I was never able to find hard scientific numbers to back it up. Fortunately, courtesy of our American neighbours, we now have those science-based data to support the former anecdotal testimonies. 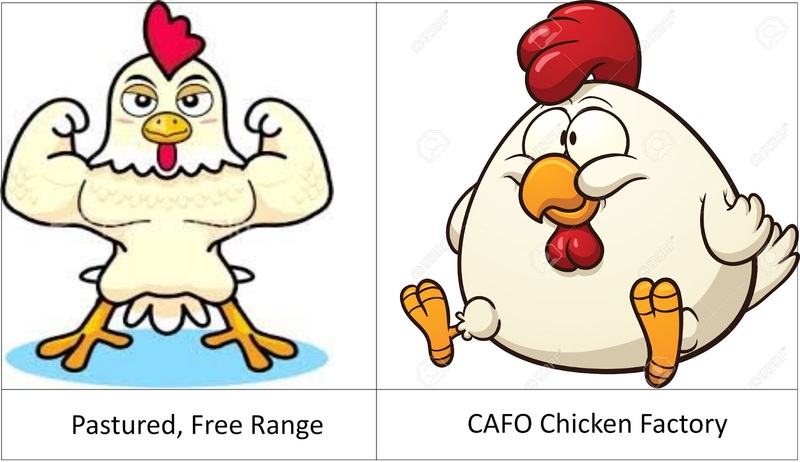 I have previous posted about the good fats and other benefits of pastured and free-range chicken (see Blog postings Animal Fat in our Diets, Vegetable Oils, Food Quality & Nutrition: Factory Chicken Vs. Alternatives, Pastured Poultry and Mental Health). 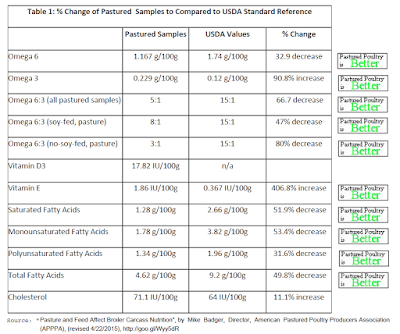 Figure 1: Comparison of chicken fats from CAFO chicken factories Vs.
American Pastured Poultry Producers Association ("APPPA") conducted the research "Pasture and Feed Affect Broiler Carcass Nutrition", on the nutritional difference between pastured chicken and the CAFO factory chicken that is ubiquitously available in all Canadian grocery stores. The APPPA's summary report was written by Mike Badger, revised 4/22/2015. 50% less fat (all types). Trans fats are the worst, often created by the chemical factory processing of vegetable oils via high temperature oil extraction (often using petroleum based solvents such as hexane), deodorization, or hydrogenation. Because they have been deodorized, we can no longer detect when the oil has gone rancid, enabling us to unwittingly consume rancid oils. Deodorizing these oils is the same as a car manufacturer purposefully not installing the LOW OIL PRESSURE switch on your car's engine, perhaps with the purpose that you will destroy your engine, and they can sell you a new car sooner. Next worst after trans fats are PUFA's (Poly Unsaturated Fatty Acids). PUFA's are an essential fat (ie. we need it but our bodies can't produce our own, so we must consume it from our food), but we only need a tiny bit that is naturally occurring in many foods. PUFA's are unstable due their unsaturated double bond, are easily oxidized, and quickly go rancid. When eaten in excess, PUFA's have a terrible effect on our liver, pancreas, thyroid, and obesity. Eating PUFA's at the same time as fructose maximizes the harm, as these interact to form AGE's (Advanced Glycation Endproducts). Omega-6 (eg. Linoleic acid such as corn oil, canola oil, and most other liquid oils, salad dressings, margarines, etc.) is a PUFA which is one of the worst, clearly shown to cause or contribute to coronary heart disease. Omega-6 fats also tend to cause or contribute to systemic inflammation in our bodies (eg. irritable bowel, rheumatoid arthritis, etc.). In North America, we consume way too much Omega-6 PUFA fat; 8 times more than historically. The rest of the world has followed us down this swampy path to PUFA hell, hurting their health too. Omega-3 ( α-linolenic acid (ALA), eicosapentaenoic acid (EPA), docosahexaenoic acid (DHA) obtained from foods such as flax seed, cold water fish, etc.) is also a PUFA. Omega-3 tends to counteract many of the negative consequences of Omega-6. Omega-3 is best consumed as food rather than as a pill or other supplements (eg. fish oil), as too much Omega-3 is not good for you, and pills are of questionable quality and freshness (ie. likely they are contaminated or denatured by the extraction process, and likely oxidized or rancid due to sitting too long on the shelf). The ALA type of Omega-3, primarily from flax seeds and other vegetable sources, can't be metabolized directly, so the body has to convert ALA to EPA &/or DHA for it to be used, and that conversion process is long and inefficient, so animal sources of Omega-3 are the best. PUFA's are in most foods, so it is very difficult to avoid them. In meats, the PUFA's aren't as bad as the vegetable oils, usually because the meat isn't rancid, and if it is rancid, it's easily detected, and rancid meat likely won't be eaten due to the terrible taste. First and foremost, PUFA's should be severely limited in our diets. For the small amounts of PUFA's that are permitted to remain in our diet, the next important factor is the Omega-6 to Omega-3 ratio. To understand the healthier choices in meat, most science-based nutritionists suggest looking at minimizing the amount of Omega-6, then minimize the ratio between Omega-6 to Omega-3 fats in the meat. Looking at the table above, we can see that soy-free pastured chicken has 32.9% less Omega-6 fat, and as low as a 3:1 ratio, both of which are excellent for a healthy diet. This research also shows that when chicken feed is made with soybean meal as the primary protein source, the chickens tend to add significantly more body fat. However, when peas are used as the primary source of protein, the chickens tend to be significantly less fatty. Of course CAFO chicken factories tend to be highly reliant on soybean meal as a cheap source of protein. Non-soy fed pastured chicken has a ratio as low as 3:1 (ie. 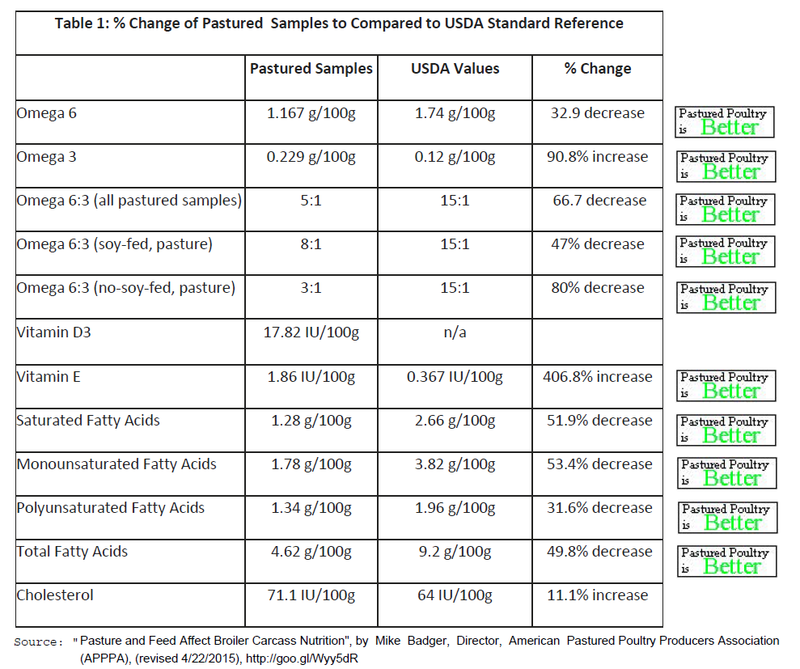 excellent), while USDA tests of CAFO chicken factory meats have a 15:1 ratio (ie. not so healthy). On this basis, pastured chicken is up to 5 times better than meat from CAFO chicken factories. Omega-9 (eg. oleic fats, such as olive oil) are mono-unsaturated fats ("MUFA") that are generally considered as excellent dietary fats, better than PUFA's. However if a MUFA is used in a high heat cooking process (eg. grilling, frying, roasting, etc. ), it will denature and form bad oxidation products. per year of waste to Canadians. To put this information to a practical test, I purchased two packages of whole chicken legs (4 drumstick & thighs per package, 8 legs in total, with skin), for a total raw weight of 2.23 kg. I paid the standard Chicken Mafia gouging prices Canadians must pay due to this unholy Chicken Mafia monopoly. I roasted the chicken and collected the grease left in the pan. 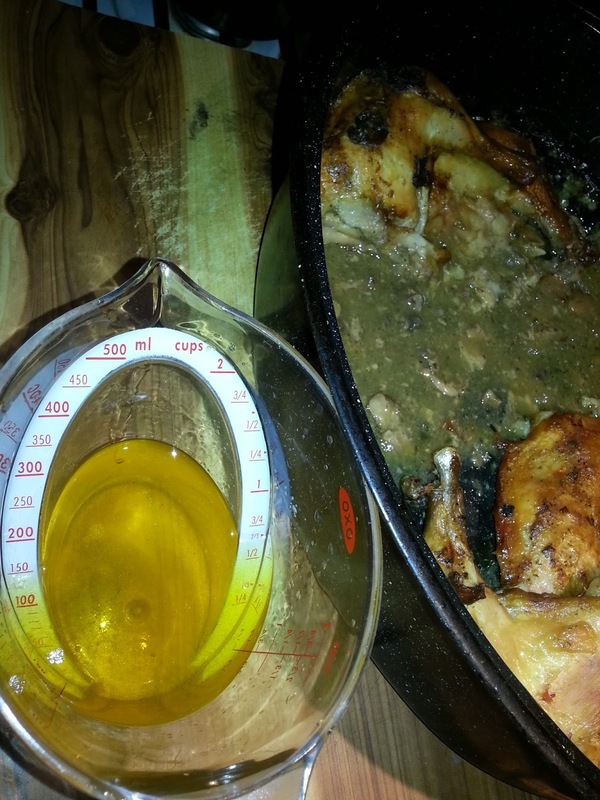 After cooking, I had 150 ml of rendered chicken fat in the bottom of the pan. I'm sure there was still some additional fat in the skin and on the legs that didn't liquefy. That excess chicken fat weighed 144 grams, so we had 6.41% (ie. 144/2230*100%= 6.41%) of the raw purchased weight ended up as unusable fat in the bottom of the roasting pan. According to CFC's Annual Report for 2014 (see page 18), Canada's Chicken Mafia raised a total of 1,067,291,000 kg of eviscerated chicken in 2014. Assuming my home kitchen test applies to all of that Chicken Mafia chicken, that 6.41% excess fat converts to a total loss to Canadians of 68.41 million kg of wasted fat. Statistics Canada Table 326-0012 reported the Canadian average cost of whole chicken in 2014 was $7.23/kg., so that excess CAFO fat is a total loss caused by excess, unhealthy fat of $494.6 million per year; forced upon Canadians with no knowledge, disclosure, nor choice. As calculated above, the CAFO chicken fat isn't healthy for us to eat, and overly fattened CAFO chickens wastes about $0.5 Billion per year from Canada's wallets. In addition, soybeans are well known for their isoflavones (such as genistein and others, plant compounds that mimic human estrogen). Soybean is the leading suspect in causing 9 yr. old girls to grow breasts and start early menstruation. See this Scientific American article. While the soybean is a relatively cheap source of protein, perhaps there are reasons for it being cheap, and we need to be wary of the hidden consequences of that cheap protein source. No doubt, soybean-based feeds for chickens will maximize the Chicken Mafia's profits. However, perhaps it would be far better for Canada and Canadians if there was a different feed formulation and/or better CAFO growing methods so as to avoid adding this excessive and wasteful fat to their chickens. There ought to be a law against the dysfunctional and questionable practices of the Chicken Mafia and their CAFO chicken factory methods. to be better for the Chicken Mafia, than for us. In short, buy pastured, free range chicken, especially if it is fed a non-soy ration to supplement its natural diet of grass & bugs. That's the best for both you and the planet. Very helpful post. Thanks you for the great source sharing with us.